Khanduja, R., Tewari, P., Chauhan, R. (2009). Performance Analysis of Screening Unit in a Paper Plant Using Genetic Algorithm. Journal of Industrial and Systems Engineering, 3(2), 140-151. Rajiv Khanduja; P. C. Tewari; R.S. Chauhan. "Performance Analysis of Screening Unit in a Paper Plant Using Genetic Algorithm". 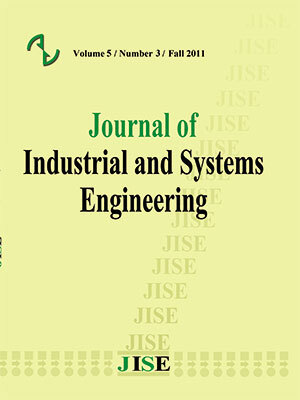 Journal of Industrial and Systems Engineering, 3, 2, 2009, 140-151. Khanduja, R., Tewari, P., Chauhan, R. (2009). 'Performance Analysis of Screening Unit in a Paper Plant Using Genetic Algorithm', Journal of Industrial and Systems Engineering, 3(2), pp. 140-151. Khanduja, R., Tewari, P., Chauhan, R. Performance Analysis of Screening Unit in a Paper Plant Using Genetic Algorithm. Journal of Industrial and Systems Engineering, 2009; 3(2): 140-151. 1Department of Mechanical Engineering, SKIET, Kurukshetra-136118, Haryana, India. 2Department of Mechanical Engineering, NIT, Kurukshetra-136119, Haryana, India. This paper deals with the performance analysis of the screening unit in a paper plant using Genetic Algorithm. The screening unit in the paper plant has four main subsystems. These subsystems are arranged in series and parallel configurations. Considering exponential distribution for the probable failures and repairs, the mathematical formulation of the problem is done by Markov birth-death process. Using probabilistic approach, the differential equations are developed. These equations are then solved using normalizing conditions to determine the steady state availability of the screening unit. The performance behavior of each subsystem of the screening unit has also been analyzed using Genetic Algorithm. So, the findings of the present paper will be highly useful to the plant management for the timely execution of proper maintenance decisions and hence to enhance the system performance. Journal of Quality and Reliability Management 20(7); 847-863.
multi-objective formulation; Reliability Engineering and System Safety 82(3); 319-330. Willey and Sons; New York. availability optimization and design; Journal of Expert System with Application 34; 181-193.
of India, New Delhi; India. screening system in the paper industry; Microelectronics Reliability 33; 1101-1105. Srinath L.S. (1994), Reliability Engineering; 3rd edition, East-West Press Pvt. Ltd.; India. Journal of Institution of Engineers (India) 84; 41-44. Manufacturing Technology & Management for Global Marketing, Chennai; 131-134.